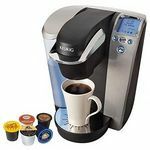 The DeskPRO Brewing System brews a perfect cup of coffee, tea, hot cocoa or iced beverage in under three minutes. The DeskPRO offers an Auto Off feature after each brew. To operate, you simply add fresh water into the single-use reservoir, choose your favorite K-Cup, brew and enjoy. One of the best coffee makers I've ever tried! If you are just looking for your basic coffee brewing system, this is an excellent choice. It is especially good if you only have a limited amount of counter space, since it is not too big and looks attractive while on display. I found that it is very easy to use and maintain, so it is a good choice for anyone who is new to using these single-cup systems. It is a no-frills sort of thing, so if you are looking for lattes and cappucinos, look elsewhere! This is your basic coffee, tea, cider, hot chocolate sort of brewer, not like you would find in a coffee shop. It makes a good, simple cup of a hot drink and is very reliable in that way. Recommended for just about anyone who needs this sort of thing and probably good for offices. I bought this coffee maker because I just needed something simple and something that wouldn't break the bank. And I have been surprised that I have gotten far more than my money's worth. Brew Performance This coffee maker is actually pretty fast at brewing coffee. I don't mind waiting a little longer to get a perfect cup of coffee, but that is not an issue here. This is a fast coffee maker and even though it's fast it still comes out brewed perfectly. Ease of Cleaning It's incredibly easy to clean this coffee maker. All I have to do is wipe around the dispenser with a wet paper towel or a wet sponge. I sometimes use a dry paper towel as well. Very easy cleaning. Ease of Use I had never used a coffee maker like this before, but I had no problem figuring out how to use this one. If I can figure it out easily, then everyone should be able to figure it out as well. Design This is a really good looking coffee maker that looks good in my kitchen. Durability This is a durable machine that is sure to last me for years. I love this coffee maker. It is smaller than others but it does just as good as a job. 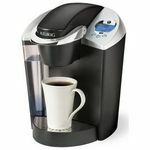 I bought it because I have limited space in my kitchen and this coffee maker fits just right and looks great as well. Brew Performance This coffee maker is awesome at brewing. It brews up coffee fast and it always comes out tasting great. It never gets that burnt taste some coffee makers are guilty of. 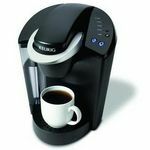 Ease of Cleaning This coffee maker is incredibly easy to clean. I just wipe it down with a wet paper towel and it looks just as good as new. 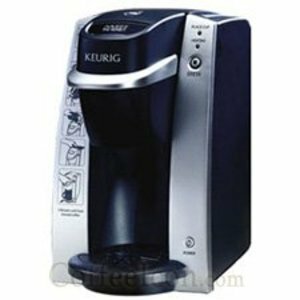 Ease of Use This is a very user friendly coffee maker. I found it extremely easy to use right out of the box. The settings are all very easy to understand. It took me no time at all to fully master what I was doing. Design I just love how this coffee maker looks. It fits in well with my other appliances. Durability This is a very sturdy and well built coffee maker. I haven't had any issues yet with its durability and don't expect to have any. Waking up every morning knowing that I can swiftly grab my desired flavor pop it in push down the top and hit the bright blue brew button on my way to the bathroom to relieve myself wash my hands and retrieve my first mornings mug ready and waiting. Flavors are what makes these style brewers excel. I can be my own personal barrista. Blueberry is not a flavor I personally thought to be an option but blueberry paired with french vanilla is soooo good. 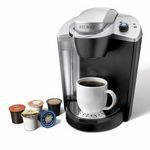 The pairing now seem endless with beans and creamers I never tire of using my Keurig. The handy mini coffee filter just makes it that more economical. Keurig has made cleanup a breeze with the overflow tray there are no leaks. Cleaning the machine take seconds. Design I can confirm that there is nothing wrong with my model I would like to upgrade just purely from the curiousty standpoint. Durability I have noticed that the heat element might be starting to be less hot than at first. Thanks to the Keurig, I have a new appreciation (and addiction) to coffee. It's so easy to use, with very easy clean up. 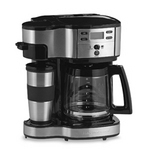 It's a great starter coffee maker, unfortunately its pretty much a one size coffee maker. Brew Performance It makes a good cup of coffee. Using the pre-made, disposableK-Cups is ideal, however, I've tried using reusable Kcups, but because I can't control the water content, the results are varied. Ease of Cleaning Aside from the occasional wipe down and emptying of the drip tray, there have been virtually no clean up. There is a video on YouTube that shows a more extensive clean up process, but I have yet to do it. Ease of Use It's practically fool proof. Just place the Kcup in, fill in the water, and brew. Just follow the lights and press the buttons. Design This is where this particular version loses points. There is only one option to brew one 8 ounce cup of coffee. I, myself, prefer a larger cup. Bigger cups or travel mugs will not fit under the pour spout. Durability So far, its been working fine. I haven't had any problems it just yet. THe coffe still brews great, but the water takes 2 minutes to heat, and I always end up spilling water as I'm pouring it in. I bought this when my bigger one died on me, and I plan on listing it on craigslist and buying the bigger one. The coffee is great tasting, but I'm impatient, which is why I use Keurig in the first place.